Voice from Aleppo: The terrorist destruction of our ancient Citadel, breaks my heart. Yesterday Al Masdar posted this report on the devastation of Aleppo’s ancient citadel by the Al Nusra and assorted NATO terrorists. After the article is a comment from an Aleppo citizen who is heartbroken by this wanton destruction. 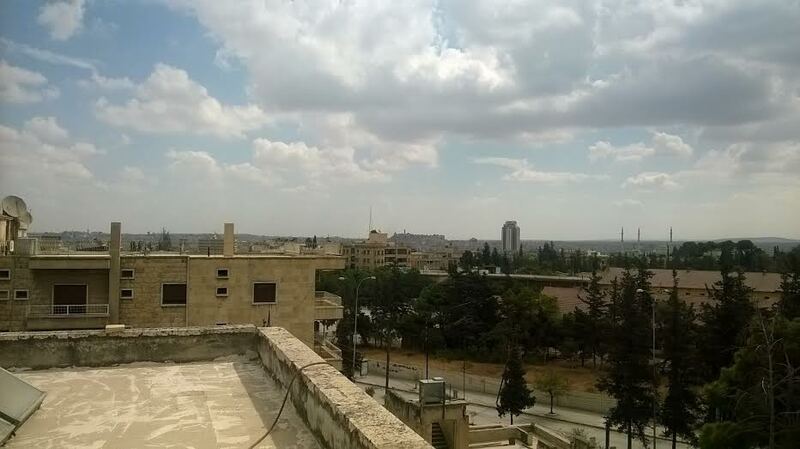 The photo was taken from their roof top in Aleppo. “The gate of Aleppo historical citadel which is listed as a UNESCO World Heritage site suffered great material damage when terrorists detonated a tunnel near the citadel which is located in the midst of Aleppo city. A field source in Aleppo said that in the framework of the continued series of crimes that target archeological sites, terrorists blew up a tunnel which they dug earlier in the western side of the citadel, causing material damage to the entrance. After blowing the tunnel up, the terrorists tried to infiltrate towards a military post in the area surrounding the citadel but the army members at the military post killed and injured a number of them while the others fled, leaving their arms and ammunition behind. “Yes I heard that yesterday in the news. I don’t have the power to see any picture of that damage. My heart is weak for such sabotaging. Those who are doing so deserve death penalty….or that is my wishful thinking law! They deserve to die in their tunnels, to buried alive with their explosives. The same for all who supported them with arms and techniques, and brought them to us. November 9, 2015 in Aleppo.